Relationships between law enforcement and the media are often prickly, but a remark made by a Florida sheriff really put a thorn in the side of one reporter. 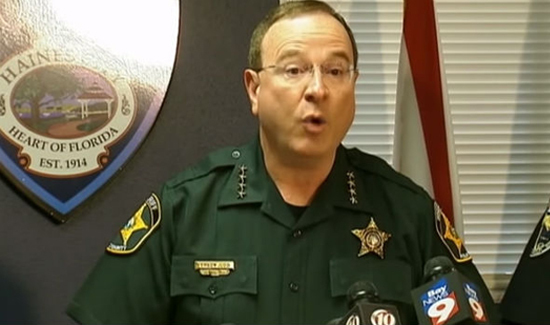 During a recent press conference, Polk County Sheriff Grady Judd said that while trying to apprehend some dangerous killers, he and his deputies were ready for a gunfight if the suspects did not come peacefully. One reporter took the opportunity to question Judd about the use of the word “gunfight,” asking him if he regretted using it. Check out the video above to hear Judd’s surprisingly candid response. Truth well spoken I wish my administration would back us like this . Good job Sheriff. Don’t sugar coat it. It is so refreshing to hear someone speak the truth without trying to be so politically correct about it. I do NOT fear the law enforcement officers in any manner. I guess it may have something to do with being a law-abiding citizen who respects authority and recognizes that when they stop me they probably have a good reason. I certainly don’t think pointing a gun at a law enforcement officer is the way to expect a friendly welcome! !